Big, fresh flavors, a chef's garden, creative cocktails and genuine hospitality make Tarpy’s a hotspot. 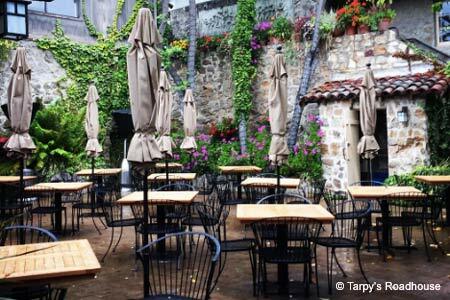 : Tarpy's is a landmark restaurant featuring a sophisticated, casual vibe and a bar boasting a creative cocktail list inspired by goods freshly picked from the on-site garden. The pet-friendly patio is one of the nicest around, and the interior has an airy and contemporary Southwestern feel. The menu ranges from light bites to comfort food. Start with a small plate, perhaps the whimsical "frickles" (hot, tangy, crunchy, fried pickles). Try the mushroom cheeseburger with a touch of bone marrow mixed with the ground beef, accompanied by a "mini" wedge salad that's plenty big. Traditionalists can go straight for the classic meatloaf --- the elevated roadhouse fare here is satisfying. Chocolate peanut butter mousse is a locals' favorite, and with good reason; refreshing house sorbets make it just as difficult to put the spoon down.